Yes. I’ve been away for a long time. Mostly trying to find my way through the tortuous and tangled jungle of self-publishing. In between proof reading and getting a decent cover design, here is a weekend post with a sporting flavour. Possibly the biggest sporting weekend of the summer. The soccer World Cup grinds on in Brazil. However since The French team were knocked out on Friday, the nation seems to have lost interest in the world’s greatest footballing event. The French now have their sporting sights firmly set on the Tour De France which pedalled off from Leeds on July 5th. Yes it may seem curious that the greatest cycle race in France, and indeed the world, should start in Britian, but over the years, the Tour de France has started in Belgium, Switzerland and even Holland. To call it a « tour » de France would be slightly misleading. The Tour never actually goes right round France. The 200 or so cyclists normally pedal their way down one side of the country before huffing and puffing their way up the slopes of the Alps and the Pyrenees. Finally all the participants hop on a train and are shunetd off to Paris for the final stage on the Chmaps Elysées. I daresay that if the Tour de France actually went round the whole of France, it would take far longer than the two and a half weeks that it already takes. The Tour de France is a sure sign that summer is here. Those who opted for an early July getaway will be sitting in their hôtels and campsites watching the Tour everyday throughout the afternoon. Those still working will either have a TV in the office to watch the race, or they’ll try to get off work early to get home and see it on TV. This year’s tour has a « commemerative » flavour, taking in some towns synonymous with the great battles of the First World War – Arras, Ypres (Belgium) and Reims. The Wimbledon mens’ singles final. Well I’m not a great tennis fan. I’ve never understood the appeal of spending hours watching two blokes slamming a balla round a tennis court. It’s the same with motor racing. This weekend is the British Grand Prix at Silverstone. This has as much interest for me as tennis – watching cars drive as they speed round a racing circuit, burning up vast quantities of expensive fuel. So, some people like it. 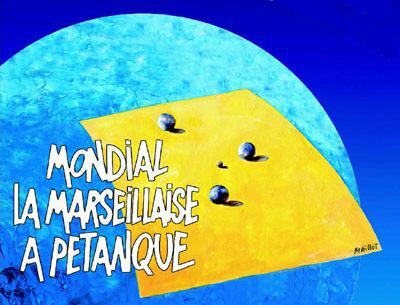 And here is the great sporting event that no one seems to have noticed – the World Pétanque championships in Marseilles in the south of France. For those unfamiliar with this most gallic of games, the principle is quite simple. Teams of two or three people hurl métal balls at a wooden jack. The team with it balls closest to the jack wins. This is the one game that every French man, woman and child will have played at least once in their lives, and the beauty is that you can play it pretty much anywhere – a piece of dry, dusty wasteground perhaps being the best (yes, I wouldn’t advise you to play this on grass or concrete. Here is the other beauty of the game, from big cities to the farthest flung and smallest village, there are Pétanque grounds everywhere – well this isn’t like British Crown Green Bowling, where you need a manicured lawn and unlike British bowls, there is no strict dress code – shorts and flip flops are fine. So, this weekend in Marseilles, over 12000 players from 17 nations are bowling it out for 150,000 Euros in prize money – for sure you’d make more as a tennis player a Formula One driver or even a Tour de France rider, but the beauty of Pétanque is that it doesn’t suffer from the media hype associated with all the aformentioned sports, furthermore, anyone and everyone cab take part in the Pétanque World Championships. Just pre-register on Internet, turn up with your « boules » and wait for the draw. Simplicity itself. 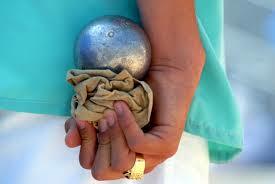 Of course, you’re better playing pétanque than watching it. In Spectator terms it is possibly just as boring as tennis and Formula One. With the Tour de France TV coverage, at least you get to see some of the stunning French countryside. Posted in France, French, Holidays, Sport and tagged Belgium, boules, Brazil, football, France, Marseilles, Pétanque, Switzerland, tennis, Tour de France, Tour de France 2014. Bookmark the permalink.